We travel along with Dorotea from a lovely cobblestoned city to the deepest jungle, in a journey filled with flavors and aromas, thanks to Mrs. Menta’s cakes. Chocolate is also a voyage through two very different worlds, from the urban landscape inspired in Art Nouveau design and architecture to the exotic, exuberant jungle settings that are influenced by pre-Colombian art. These two distant languages merge, coming together as one. The Apel·les Mestres Award is very respected within the world of Spanish illustration and is known for selecting books with both high quality texts and illustrations. This year the award was given to a young rising star in the world of illustration. 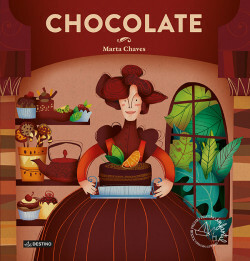 Chocolate is a tale of fantasy, travel and history that brings together two seemingly very distant worlds.